When I tell people that I facilitate creativity courses, they either think I’m joking or that I’m talking about sessions where we string beads and color fabrics. Nope. I’m talking about creativity as such, as a way of thinking, as a method of problem-solving, as the basis for the work of artists, businessmen and even scientists. The ability to be creative was given to all of us, just like the ability to walk or talk, but only some of us developed it. I didn’t come up with this concept. 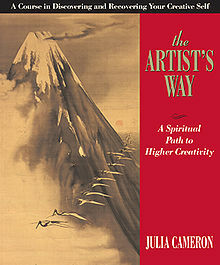 Artist’s Way is a tried-and-true method compiled into a bestselling book by Julia Cameron. 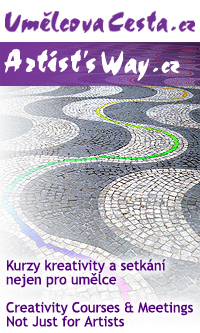 It so significantly shaped my own creative path that, together with my project partner Jaroslava Vatay, we decided to run courses based on this book, but including our own methods for developing intuition, gaining inspiration and overcoming old blocks. Jaroslava is an amazing body-and-mind therapist, with much experience in running various transformational courses and rituals. We operate courses in both Czech and English, structured as 3-month runs of 13 sessions, plus a closing party, where participants can celebrate both the completion of their journey and present the results of their creative endeavors. Not everyone needs to be a famous artist, but everyone needs to be creative – at least sometimes, whenever and wherever a creative approach is appropriate. We don’t instruct people how to be creative, we make them look outside themselves for inspiration, motivation, sources of energy and excitement, in order to facilitate their natural creativity – whenever and however they want. There are countless ways to be creative and they all make our lives richer and more fun. They also make us better people. It doesn’t come easy. To unblock creativity, we need to first dig into some of the old solid and personal mud, stirring it around a bit before a fresh stream carries it away and the waters become clearer. The three months of the course are, naturally, only the beginning of a lifetime process of further development and maintaining new, healthy habits that keep the creative juices flowing. I admire how much work and dedication our participants put into it. It’s an honor to witness their transformation and a true challenge to be their guide through that personal mud. Helping to change people’s lives is by far the most rewarding thing I’ve ever done. I thank Jaroslava for helping make it happen, our wonderful assistants for supporting us and our participants for their trust and dedication. You guys are all amazing! Keep on creating!